Make sure you’ve installed the latest software & app updates. Criminals use weaknesses in software to attack your devices and steal information, such as your payment details. Use a strong, separate password for your email account. 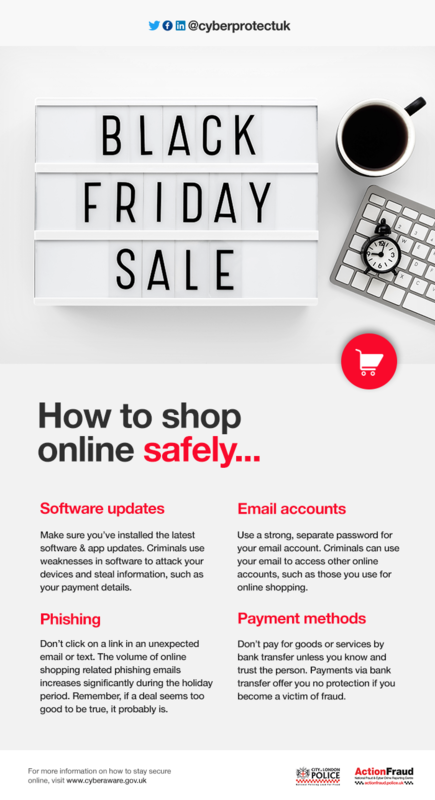 Criminals can use your email to access other online accounts, such as those you use for online shopping. Don’t click on a link in an unexpected email or text. The volume of online shopping related phishing emails increases significantly during the holiday period. Remember, if a deal seems too good to be true, it probably is. Don’t pay for goods or services by bank transfer unless you know and trust the person. Payments via bank transfer offer you no protection if you become a victim of fraud. For more information on how to stay secure online, visit www.cyberaware.gov.uk.